From a working class family, I had knowledge of the migratory labour patterns of the United Kingdom. 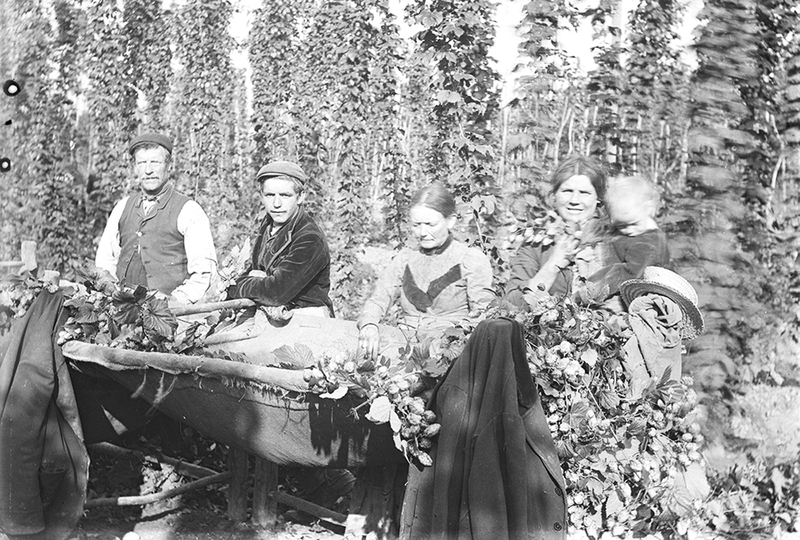 With a mother from the East End of London and a father from Inverness in the North of Scotland, I knew of the annual hop picking journeys made by whole families from the East End of London and the patterns of seasonal labour migration made by the sea-board communities of Scotland and the Scottish urban communities which serviced agricultural harvests. 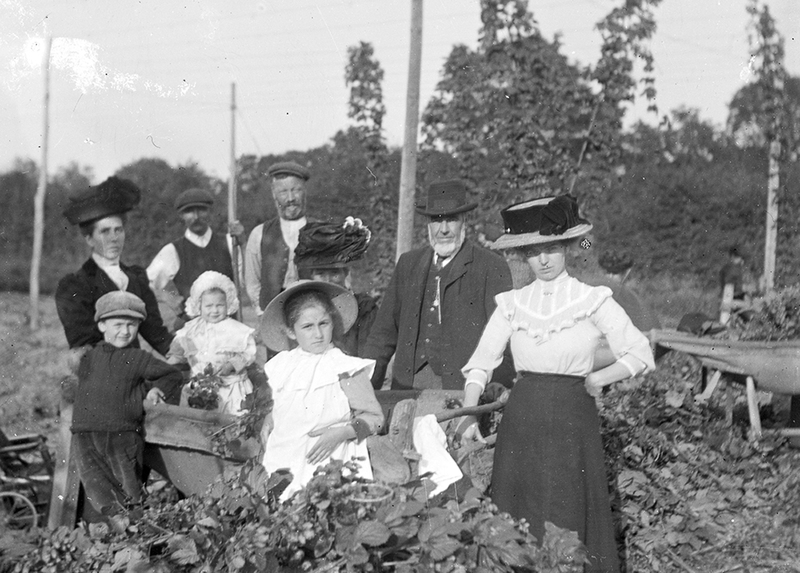 Labour was roving and urban working class families had agricultural skills in abundance, despite the stereotypes which saw their roving labour as unskilled, unorganised and very often as dissolute. My own family’s skill base and its knowledge of the skill base of other families provided me with the insight into the complex social organisation of working people as they pursued their skills in the pursuit of gainful seasonal employment. The external world saw casual employment as a simple free-for-all arrangement and the academic world followed suit. My own Oxford doctoral thesis explored the role of social and kin networks in skilling labour and securing employment, but at the end of the process I knew that there was more to know about the social organisation of hop picking, so I set about researching the topic through oral histories, brewing company records and press reportage. I focused on the annual journeys from the East End of London to the hop fields of Kent and Hampshire and published a book entitled ‘Workers’ Dilemmas – Recruitment, reliability and repeated exchange: an analysis of urban social networks and labour circulation (Routledge, 1996). 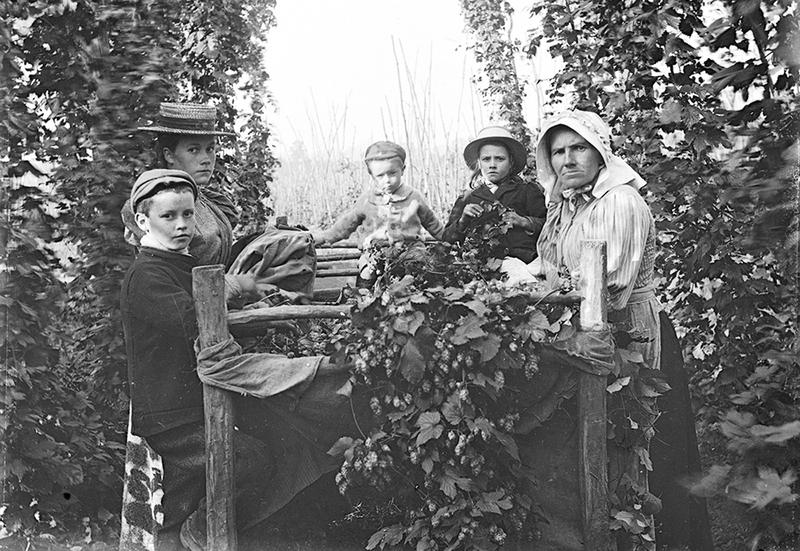 This book recorded the complex social organisation of hop picking from a range of perspectives including, most importantly, that of the hop picking families themselves. 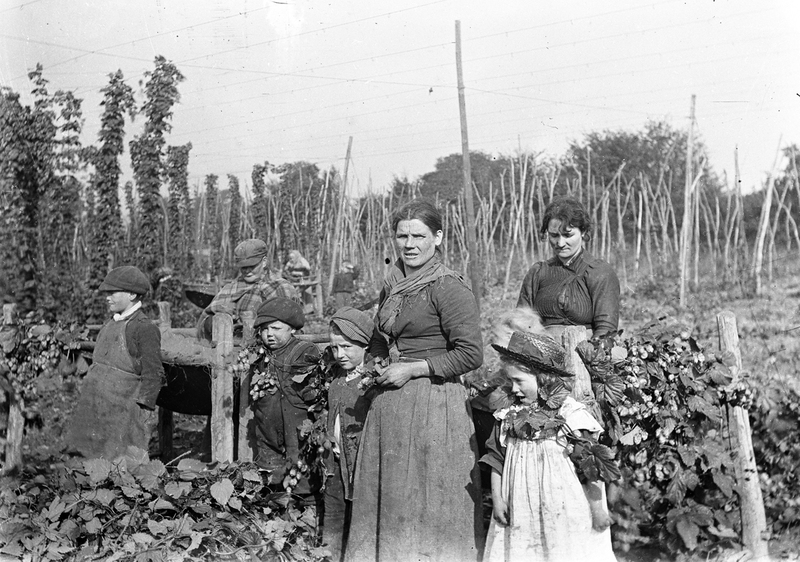 It showed that there was a mass migration of seasonal labour from urban London to the hop fields of Kent and Hampshire for the duration of the first half of the 20th century. In researching these East End of London, Kent and Hampshire labour circulation patterns I came across evidence of comparable patterns of West Midland urban labour’s involvement in the hop fields of Worcestershire and Herefordshire and Dorset. Evidence from Priory Street, the Gun Quarter, Birmingham: Personal communication from Len Holmes on the basis of information furnished by his mother, Mrs Holmes, whose childhood was spent in Priory Street, in the Gun Quarter of Birmingham, where both children and women were extensively involved in agricultural harvesting of potatoes locally (Tamworth) and further afield in the hop fields of southern England (Westfleet). 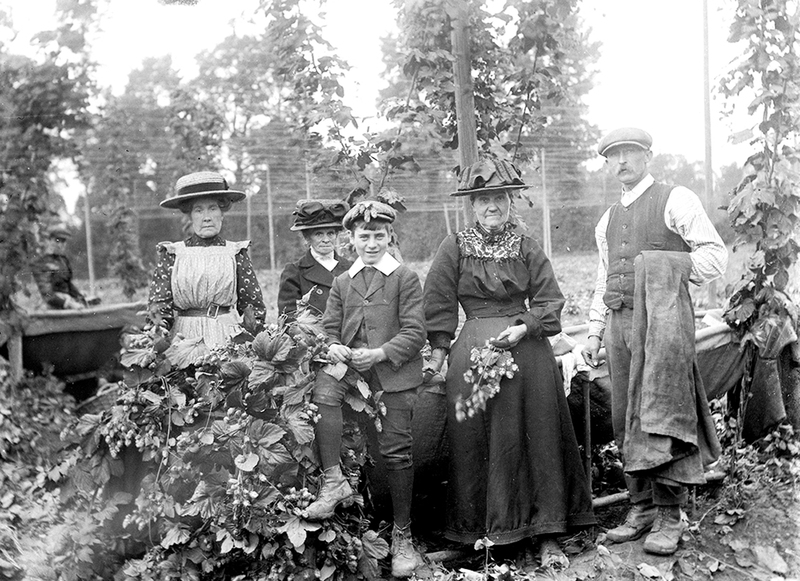 Recently, I have collated a wider set of materials which show evidence of the historic involvement of urban labour in the seasonal hop picking workforce in Herefordshire and Worcestershire. The seasonal migration of labour or urban families to agricultural space is also a major dynamic of West Midlands and Black Country life until the mid 20th century and it too is a dynamic which has been poorly recorded by the academic literature. 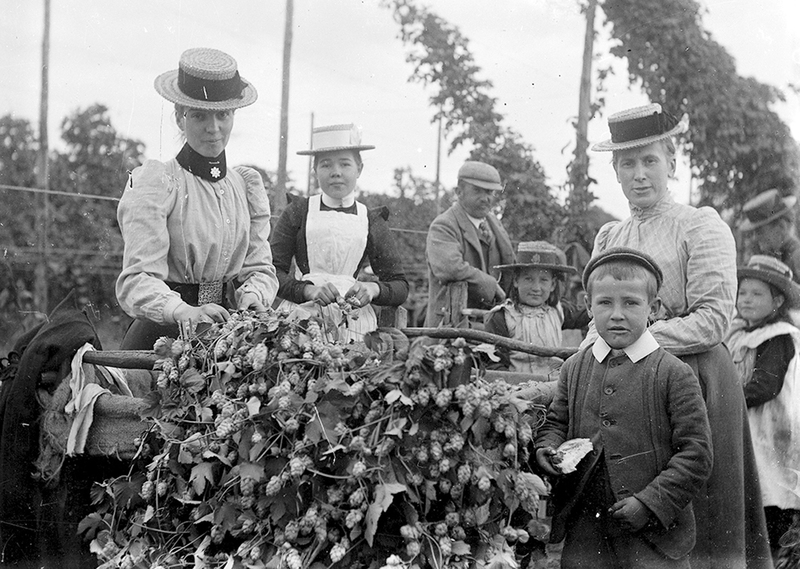 My argument is that these patterns were an outcome of the family operating as a coordinating and skilling agency which provided organisational benefits to employers and an outcome of families taking the social space provided by hop picking – beyond the simple earning of a wage – to repair and to enjoy themselves. The social accounts of hopping stress the fun that was had as well as the improvement in diet that occurred without denying the heavy discipline of the work that was undertaken. 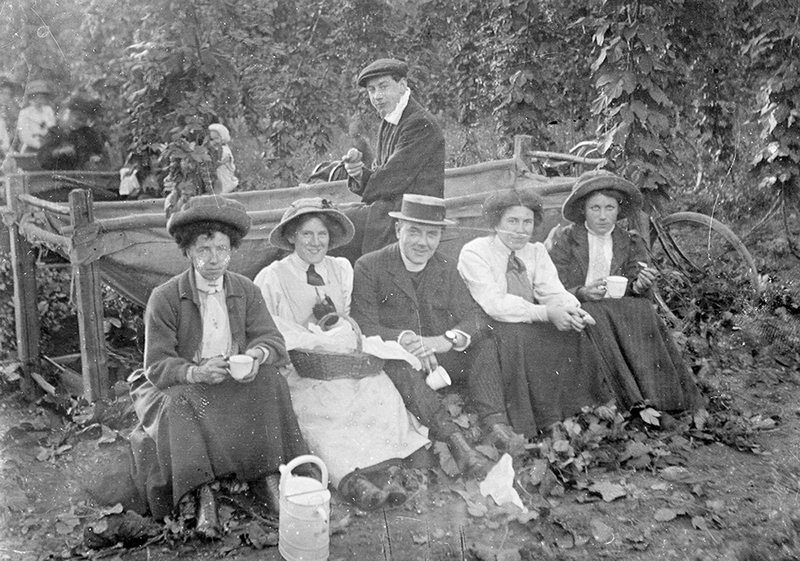 Hopping was viewed as a working holiday and social accounts of hopping are heavy with nostalgia. 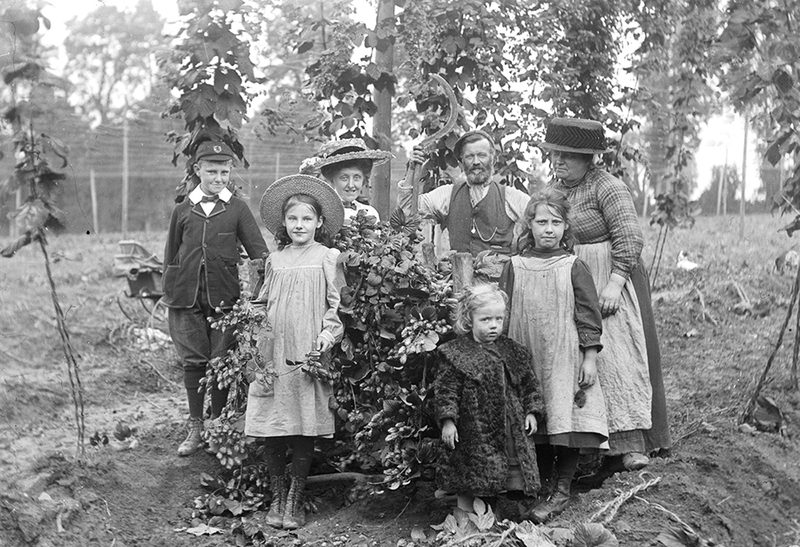 Children, although their labour was part of the hop-working package provided by families to the hop farmer, were encouraged in the view of hopping as a festival and a holiday by the social activities and the framework of humour provided by the adult labour force. 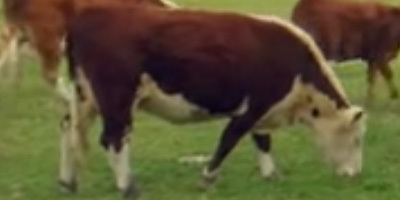 The evidence of Dennis Turner: My family lived in Netherton and each hopping season we would go with our mother Lily Turner to Bishop’s Frome and Farmer Parker’s Farm, which was known to us as The Five Bridges. Our journey was by Midland Red bus and all our luggage would be taken by the farm owner’s lorry and delivered to our quarters. When we were bigger we were allowed to travel on the lorry with the luggage. What larks, what utter delight. The evidence of Graham Paul Webb: In the 50s it was quite common for working class Brummie families to go hop picking, not only to earn a few extra bob, but as their main summer holidays in the country. We would get picked up in Sparkbrook by one of the farm hands in an open backed lorry, very open! I often wonder how we managed to stay on the back with the wind clawing at our frail, famished bodies and all the bumps in the road threatening to buck us off like a bronco. We were with many, Mum, sisters, Barbara & Margaret, brothers, Ronny and Ted, Auntie Liz, Uncle Fred, Cousin Fred, I, the youngest at 6 years old, and others from unknown back streets of Brum huddled together. Most of us had only got the clothes we stood in and a few brown paper parcels tied with string, containing a few personal items. No one had a suitcase, we were not that rich! 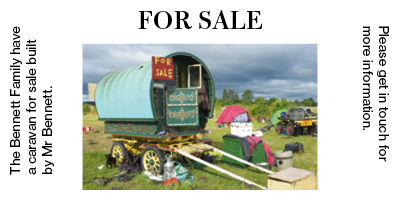 I had heard that some hop-pickers were transported to the farms in a ‘charabanc’ (these days we would call it a motor coach), but in our case that was a luxury we just couldn’t afford! 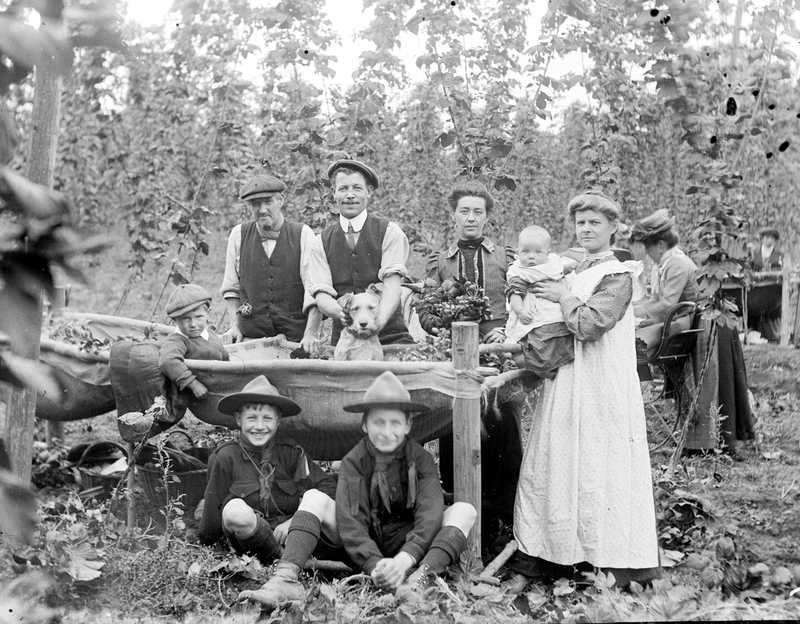 Hop picking appeared to the outside world as if little skill was involved, but in fact it required a highly skilled large labour force and the best recruiting and training agency for this was the large extended family and its extensive social and neighbourhood network. 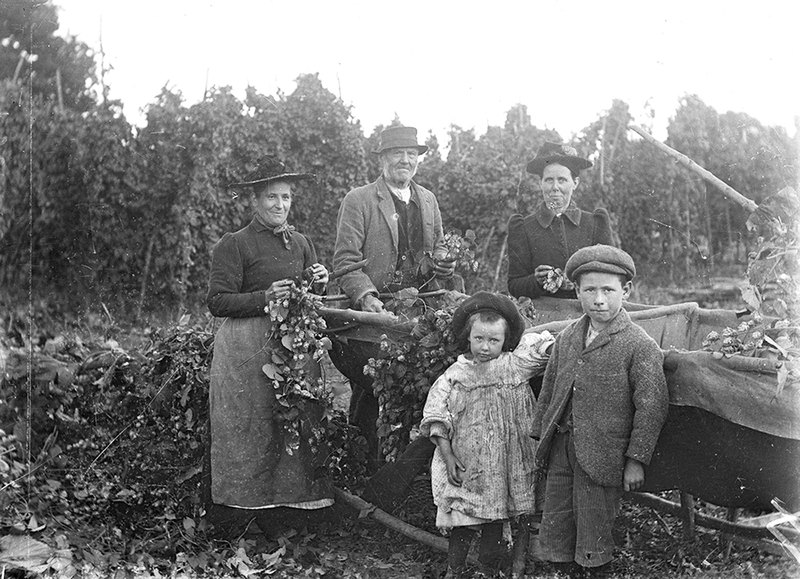 Each hop field had its own links with its source of urban labour and each family and social network had its own links with the hop farmer: year after year families returned to the same hop field bringing with them new labour to train. Inside this arrangement family insiders achieved skills and those without attachment to ‘traditional’ hopping families were placed at a disadvantage. 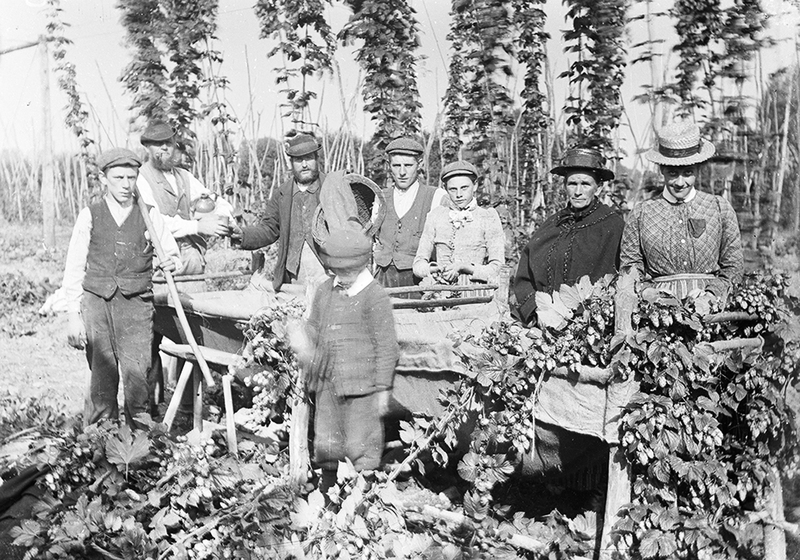 Skills became normalised within families – both hop farmers and hop labour were aware of the shortness of the harvest and the dangers of unskilled labour spoiling the crop in such a short season. For farmers, securing their labour in advance of the short hopping season was imperative and, for families, securing the hopping employment which brought much needed income and a huge variety of social and health side benefits was equally important. 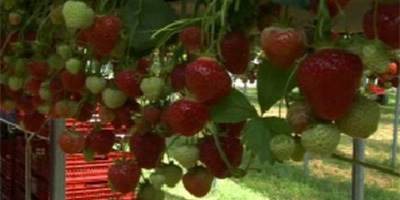 The annual reactivation of the hopping contract between farmers and workers was a vital part of the annual calendar for both workers and employers. The evidence of Richard G Mayer: It (September) was a month free from drudgery. Folk harvested the hops and were paid for doing it. Nothing but sickness or death was allowed to interfere with the annual pilgrimage. 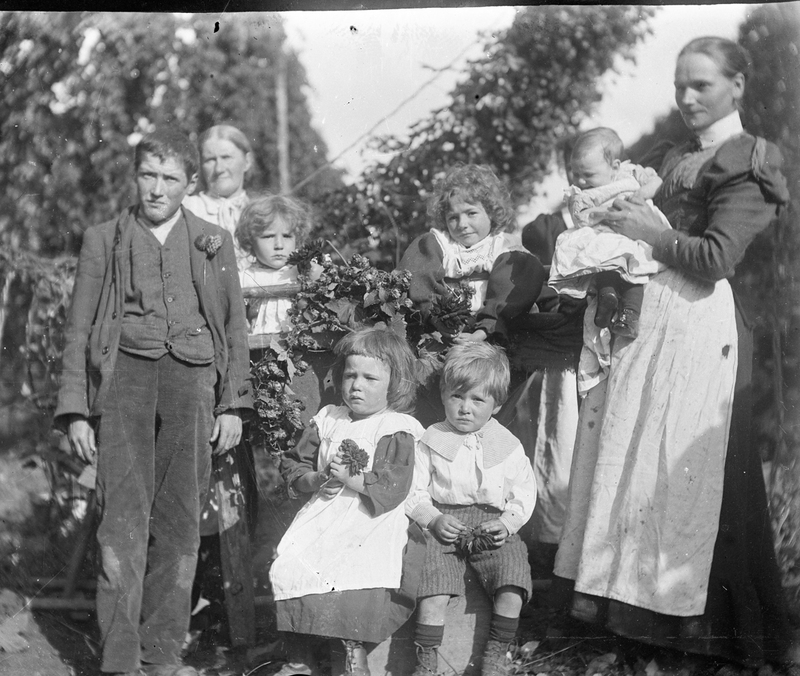 Generation after generation, members of the same Black Country families became attached to the same farms, almost as though by hereditary right. Year after year since the railways first opened, on the first Saturday of the month, families of hop pickers, men, women and children with babies in washing baskets, with their tin trunks stuffed with palliasses (straw mattresses), blankets and pots and pans crowded the platforms to wait for the ‘specials’ that would convey them across the river to the hop yards. I remember that one of these trains began its journey at Smethwick Junction, picked up passengers at the stations between there and Stourbridge Junction, crossed the river at Worcester and distributed them at stations along the line that ran through Bromyard and Leominster to end its journey at Presteigne. Another train crossed the Severn at Dowles Bridge and went along the line to Tenbury Wells. 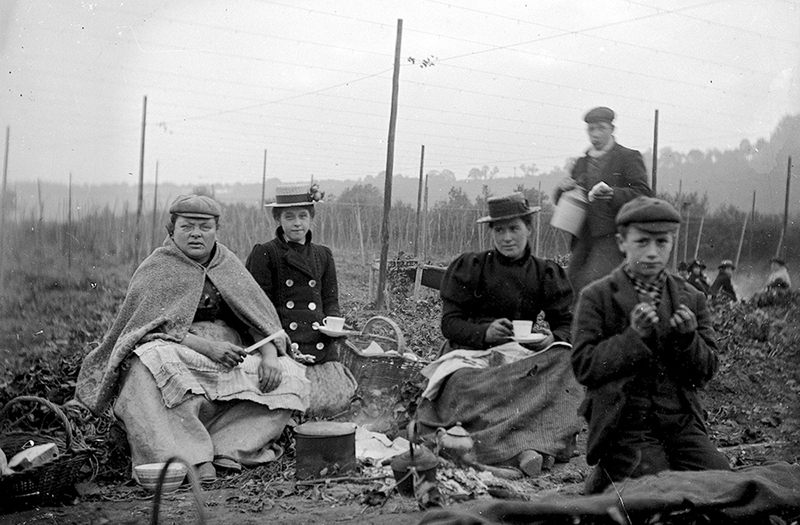 Year after year neighbourhoods were transported from urban Britain to the rural hop fields – neighbours in low income urban Britain were neighbours in the temporary accommodations of the hop fields. In east London, each year the matriarch of a hopping family network would receive a ‘hopping letter’ from the farmer she had worked for the season/s before contracting her and her network for the upcoming hopping season. 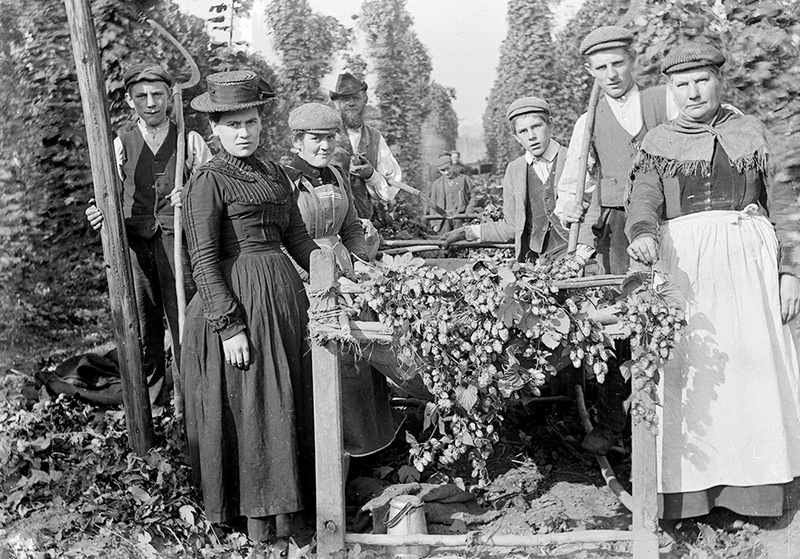 Employers’ ability to summon labour to the hop fields both depended upon and compounded the cohesiveness of social relations within kinship and neighbourhood structures. 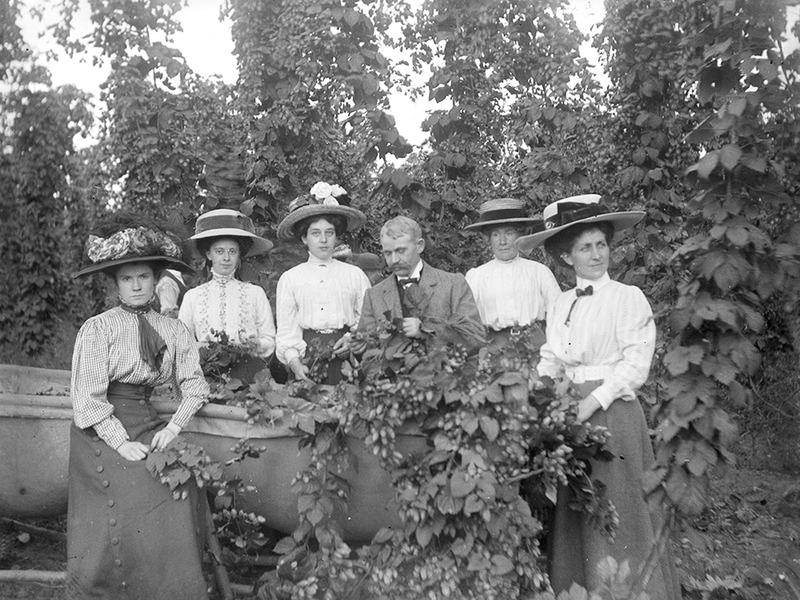 Like many employers in modern industrial society, the hop growers harnessed and depended upon existing patterns of social relations – ie social networks – in their recruitment dynamic. As a consequence and concomitant of this process, these social networks frequently came to ‘own’ sets or clusters of hopping employment vacancies; effectively they became the owners of occupational property. Whereas, in many cases where such occupational property can be observed to exist, there are no formal markers on this ownership of employment rights, in the case of hopping there were some formal markers on the extent of this occupational property. The hopping letter of East London was one such form. This letter would be followed by a letter from the farmer offering the woman employment for her and her family for the hopping season. This exchange of letters would take place in the April and be followed up by a postcard from the farmer to the matriarch in the August to confirm the hopping employment was going ahead. Far from casual employment being unorganised, it was highly organised and highly calendared. 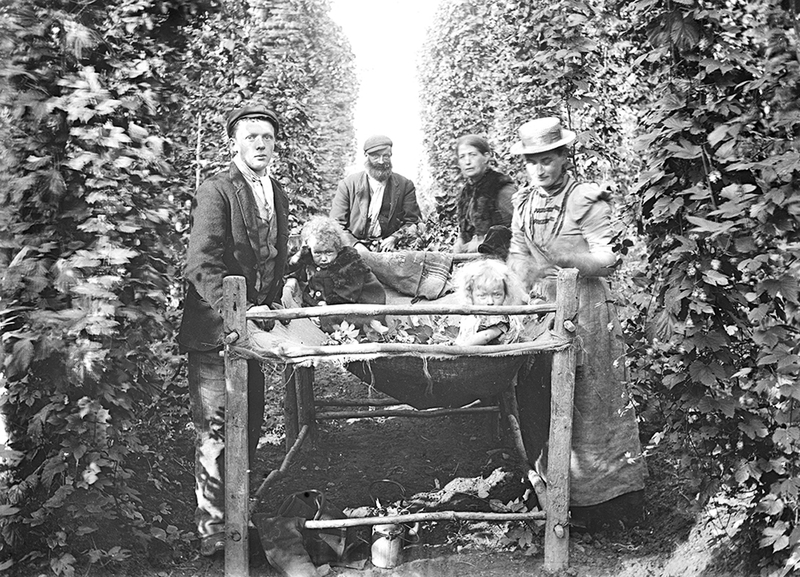 In the Black Country, West Midlands, Herefordshire and Worcestershire and Wales, hop farmers would come and make hopping contracts with labour that had worked in the hop fields the year before. 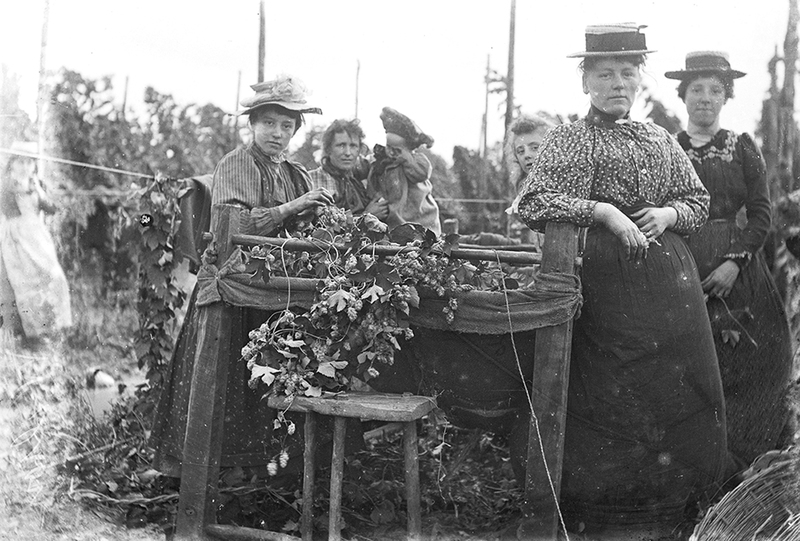 There are examples in oral history accounts of women going to the farmer before the season to take the contract for providing the family labour for that year’s requirements. 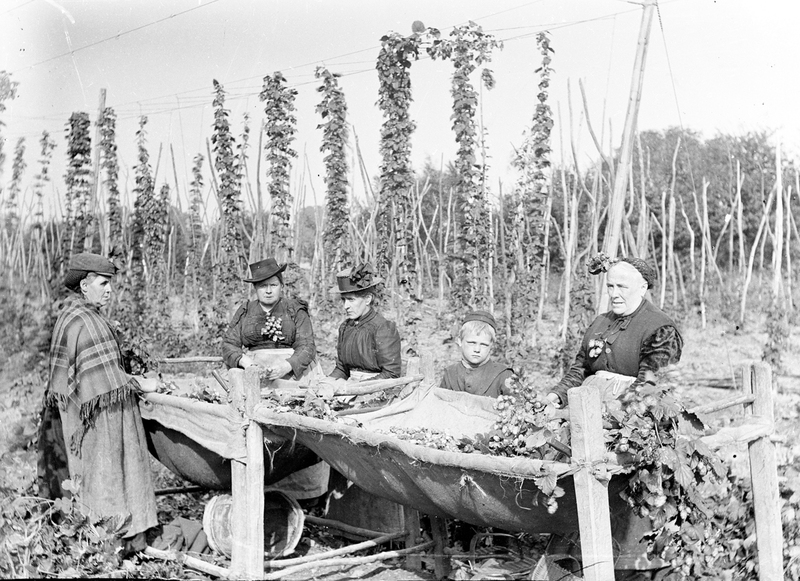 As with east London, the recruiting dynamics of the hop field fell on the shoulders of senior women in the family and in a context where there were particular links between specific rural areas and specific urban neighbourhoods that were annually renewed. 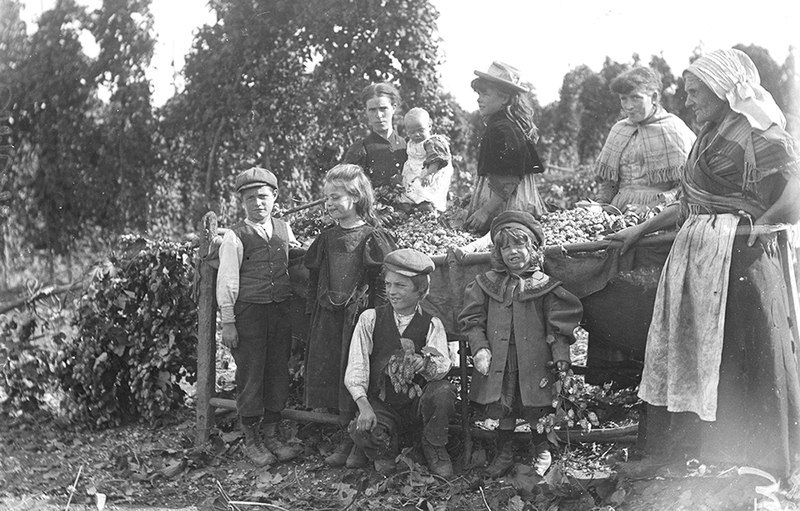 An excerpt from When I was a Boy, by Clifford Willetts OBE (1896–1980): The hop-picking season was the highlight of the year for the poorer families. This was in September. 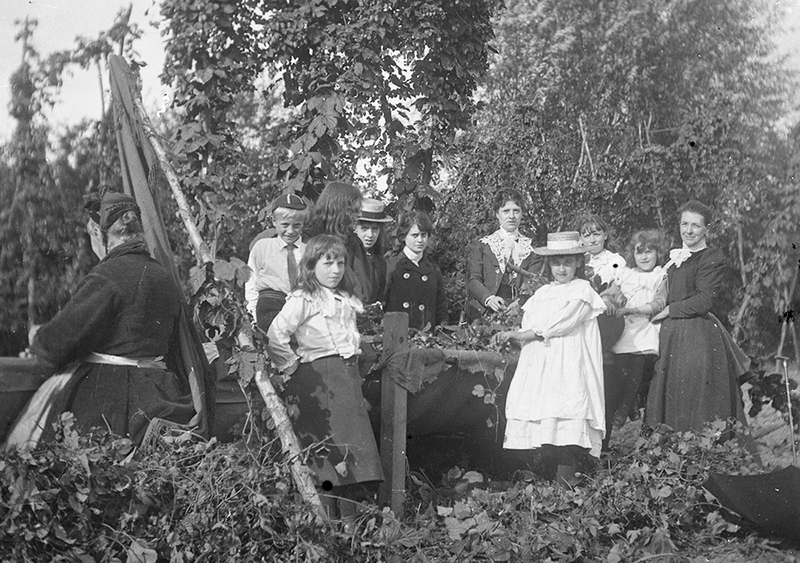 School holidays coincided with the hop-picking season, as otherwise the schools would have been half empty. Hundreds of Cradley families made the exodus to places like Leigh Court, Leigh Sinton, Bransford, Newnham Bridge, Tenbury, Knightwick, Whitbourne, Callow End, Bromyard and Hereford. These places were household names in Cradley. 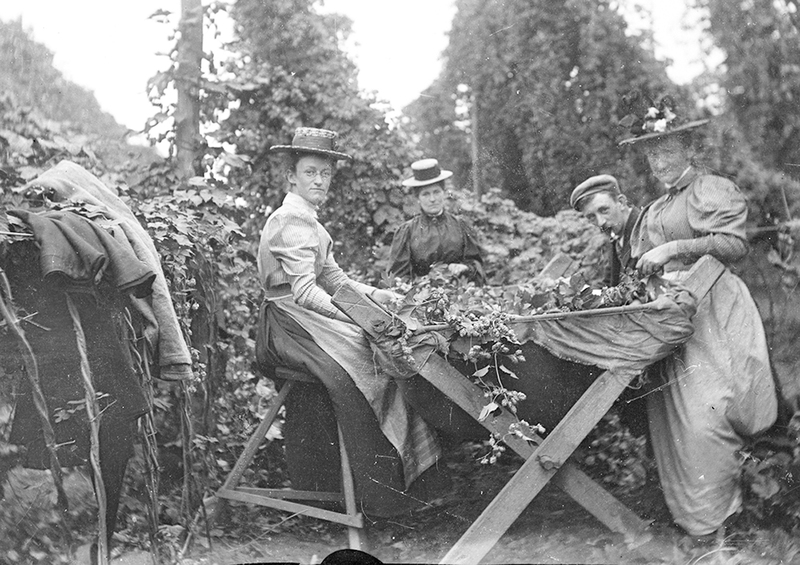 The evidence of Janet Faraday on The Moor Farm, Eardiston: When a hundred acres of hops were ready for September harvesting, a large and varied labour force had to be organised. Many of the pickers were comparatively local, but the majority had to be recruited from the Black Country and accommodated in crude, if fancifully named, barracks: Regent Street, Piccadilly Circus, Trafalgar Square. 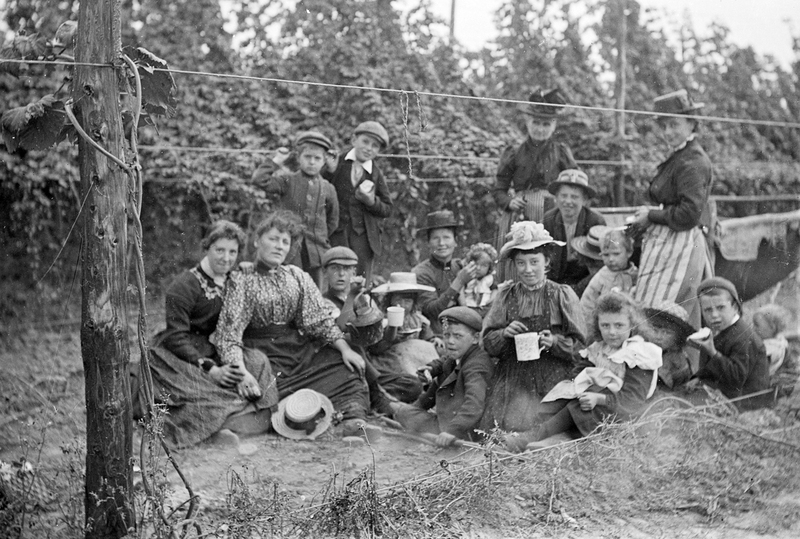 One consequence of hop farmers recruiting their labour force through senior women in the family was that both the discipline of this labour was managed by the women and the payment of the work group or work gang was to the senior woman who would then disburse the individual payments. This provided these senior women with more income in their hands at the point of payment than any of their male counterparts would have at any point in the annual calendar of wage payment. The evidence is that this lump payment enabled senior women in the family to manage familial resources in an effective way that has largely gone unnoticed in history and in sociological literatures. At the end of the hopping both east London labour and Black Country families celebrated festivals of renewal. 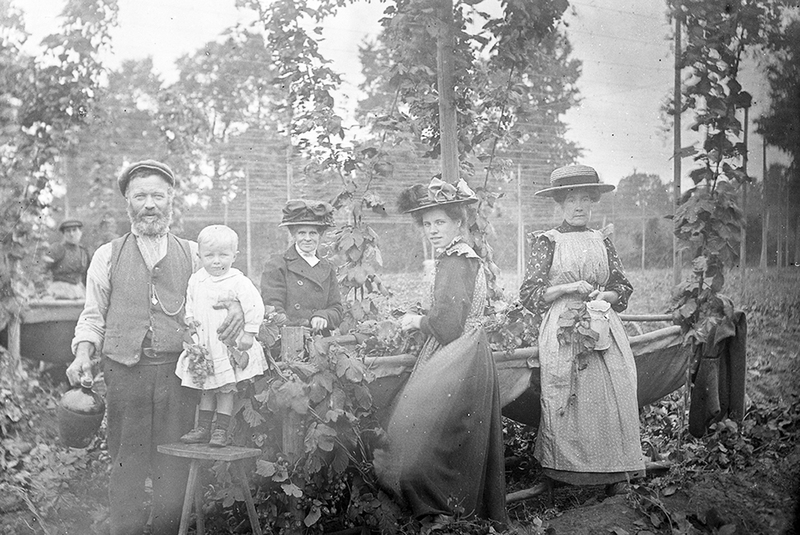 New clothes were bought, urban grocery debts were paid off and families got ready for the winter with the organising of provisions and the storing of foodstuffs – such as apples – brought back from the fields. In the east London accounts of the hopping accommodation, there is substantial work undertaken prior to the hopping season by the hopping work force to shape their accommodation into its best possible form. 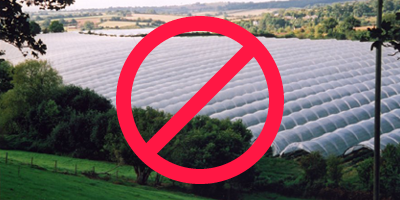 Visits are undertaken to the hop field accommodation to whitewash it and generally to improve the accommodation which can have been used for other agricultural purposes in the intervening period. The oral histories talk to quite elaborate routines of beautification – this may very well have been necessary to convert stabling into accommodation suitable for children and the sick and vulnerable who were often ‘sneaked’ onto hopping holidays to give them a chance to repair in the country air. The strength of the informal organising processes of labour as demonstrated here must lead us to question the orthodox characterisation of working class behaviour as hedonistic and poorly planned. The prevailing characterisation of historical working class planning competences as deficient and short sighted needs to be tackled at both a theoretical and an empirical level. This is best done by discussing the way in which families and neighbourhoods built into their annual budgeting, seasonal sources of employment. These sophisticated budgeting arrangements were not produced out of thin air but were themselves the product of the careful development, nurturing, maintenance and annual restoration and reconstruction of an impressive range of skills. The recurrent and repeated return of family labour to the same source of employment on an annual base ie labour circulation, simply can not be explained within the terms of the conventional account of the working class’s inability to strategise and plan. In the West Midlands, Black Country, Worcestershire and Herefordshire so far I have found no mention of outside season journeys for preparing the accommodation though much mention is made of the ’hoppen’ trunk or box, which was filled with all the household goods and utensils that the family would need on the hop fields, and there is mention of the role of white washing the accommodation for the hopping season being undertaken by the hop farmers. The Blackheath pattern: Each family took along the old tin chest, which contained everything they thought they would need. However, the first priority was, how would they get the chest down to Blackheath railway station. If they were lucky, someone would kindly take them along with the chest on an old lorry otherwise they used any form of transport available, ie an old clapped out wheelbarrow, pram wheels with a couple of pieces of wood across, perhaps an old heavy pram, or they would just have to drag it, going a few yards at a time, stopping for a breather, letting the straps hang on the floor for a while and then, in turn, carrying on pulling the valuables to the station. 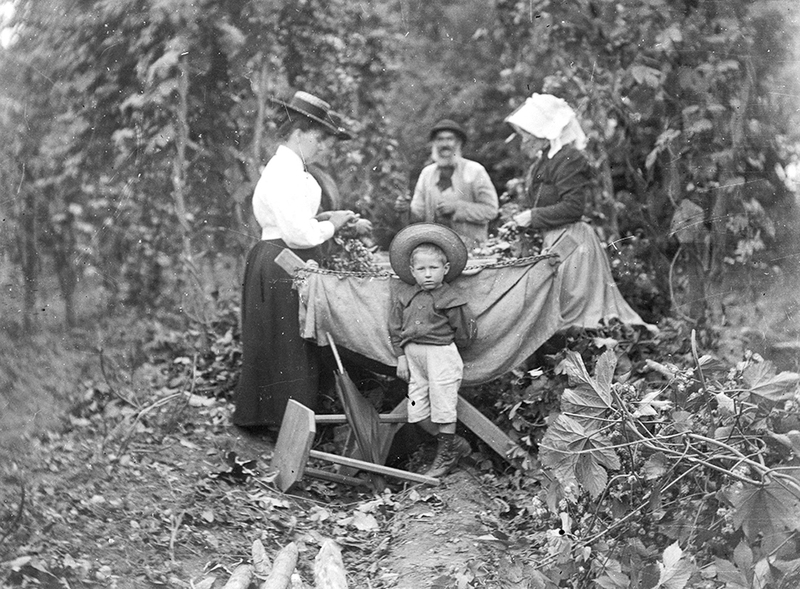 Similar trunks or boxes – very often tea chests – were sent from east London to the Kent and Hampshire hop fields. Evidence for the Black Country shows some farmers being involved in the transporting of these household goods to and from the hop fields. Lorries were hired or farm vehicles used to connect the urban workforce up with its rural accommodation. Some families had to organise their own transportation of goods and children’s prams found their use in the transportation of household effects. Mobility was synchronised through families, through neighbourhoods, through local lorry services and through the employing farmers. Trains played an important part and added levels of excitement for children and many adults as well. 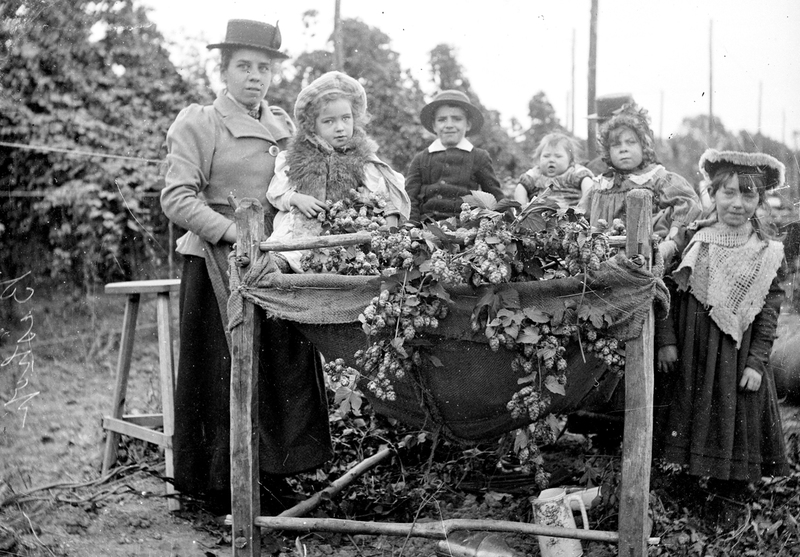 The images of the hop pickers as an army of women and children abound in the popular press and it is not surprising that the label ‘barrack’ was applied by some to the hopping accommodation. 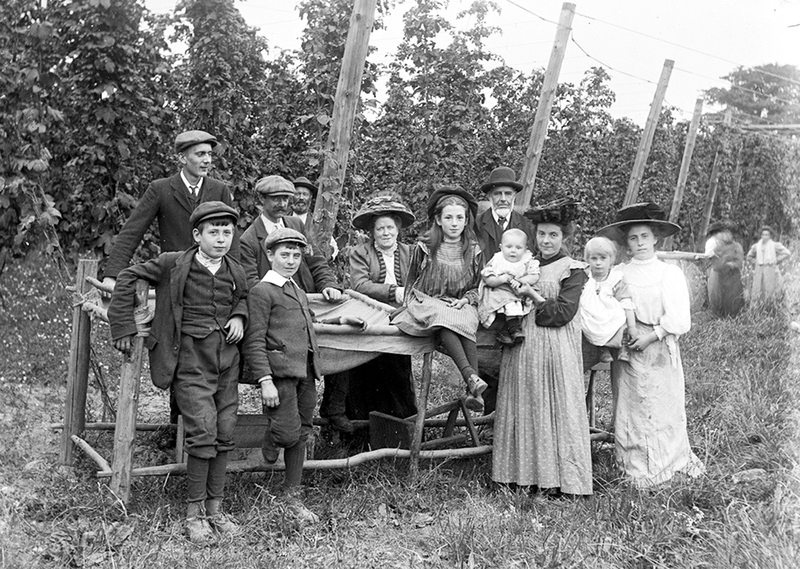 The wholescale movement of social neighbourhoods to the hop fields was accompanied by the movement of the grocers and small businesses that serviced them in the urban community. Weekends saw the arrival of relatives who had remained behind in the cities and towns to work, and they also saw the arrival of grocers and other traders. 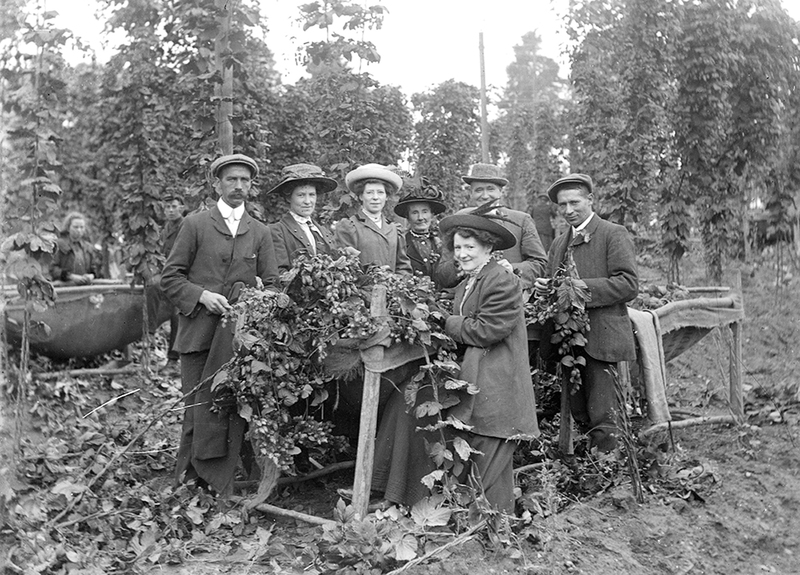 The hop workers received credit against their end of season wage and women were very much in charge of the household finances at this point in the annual calendar of assets and responsibilities. 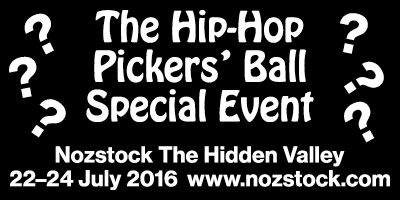 The urban neighbourhood was recomposed in the hop field right down to its normal commercial activity. This Dudley pattern mirrors that found between east End of London traders and their urban/seasonally rural clients. 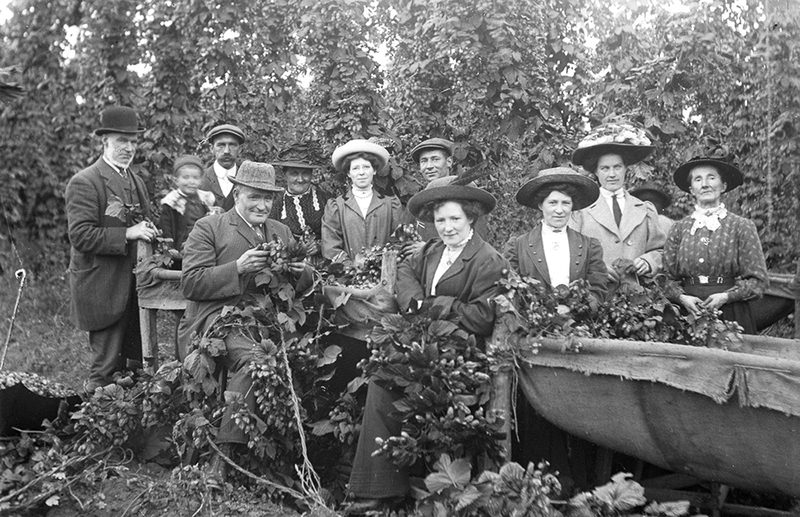 The neighbourhood pattern of trading was re-established in the hop field: hop pickers represented a major custom base for the annual calendar of trading. 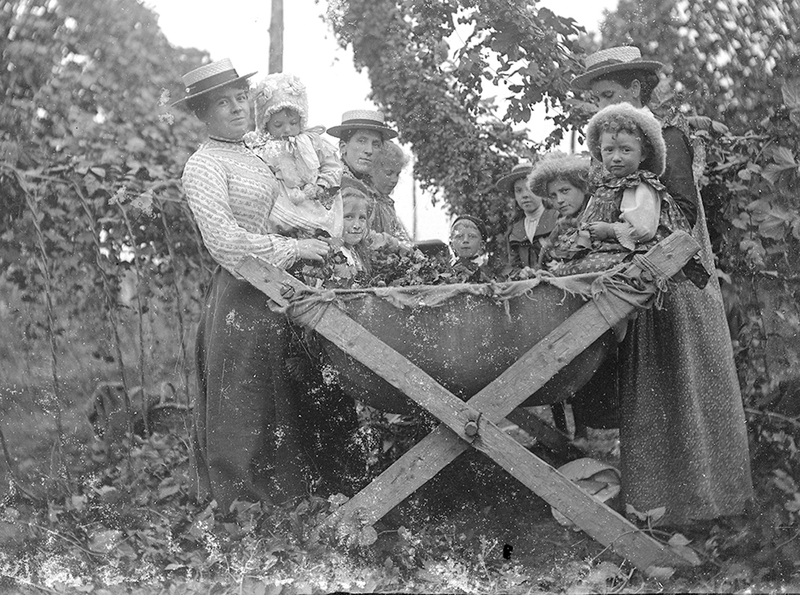 In Herefordshire the custom base provided by the ‘army’ of hop picking women and children at one time produced a form of ‘hop picking coinage’ where payment tokens provided by farmers were used in the payment of local tradesmen. 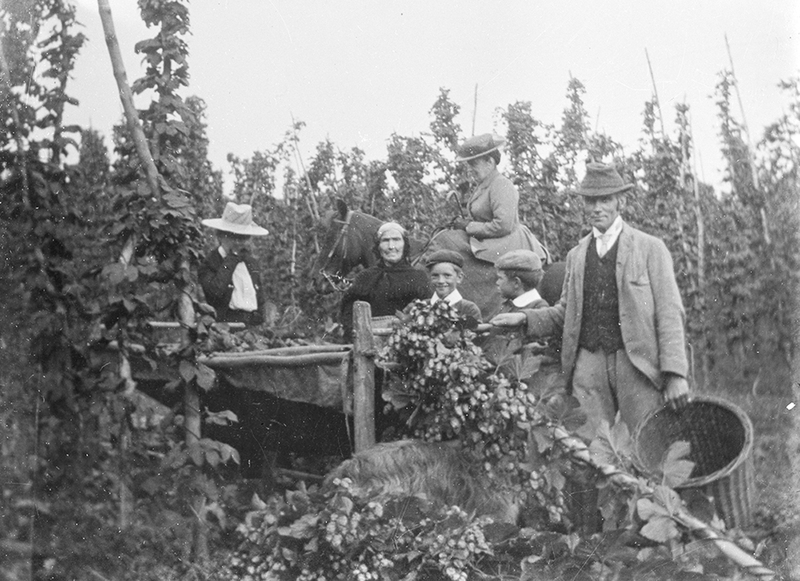 The evidence of Miranda Greene: By the late 19th century Herefordshire hop growers had changed to the hop check or token scheme. Tokens were coin-like metal discs of various sizes, all stamped with the farmer’s name. The smallest represented a single bushel and these could be exchanged for ones marked 1, 3, 5, 10 and £1, indicating the amount earned by the picker in shillings and pounds. These tokens could then be exchanged for cash at the end of the picking season or, if strapped for cash, at the end of the day. The tokens could be spent at the local pub or shop and were accepted by most local tradesmen. 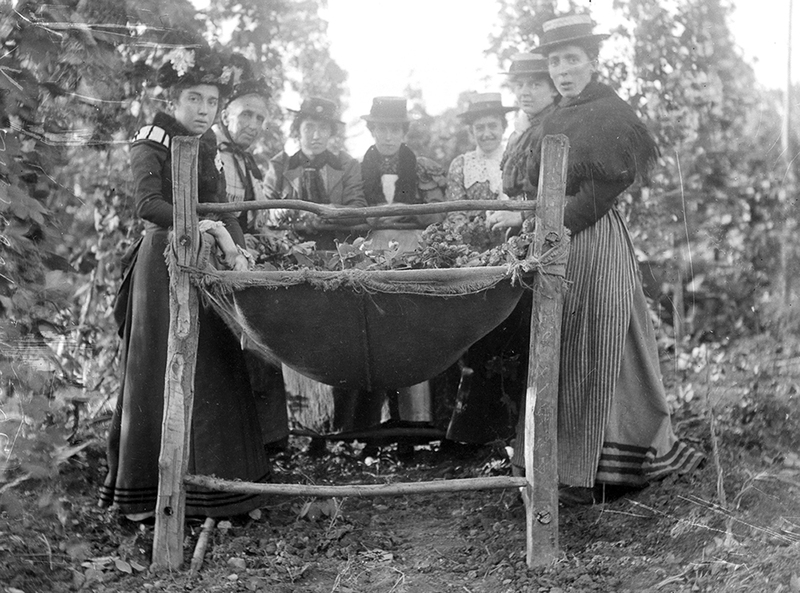 Hop wages not only provided a budgeting resource when they were paid out but also when the matriarchs and their social networks had the commission for hop picking employment in their hands. 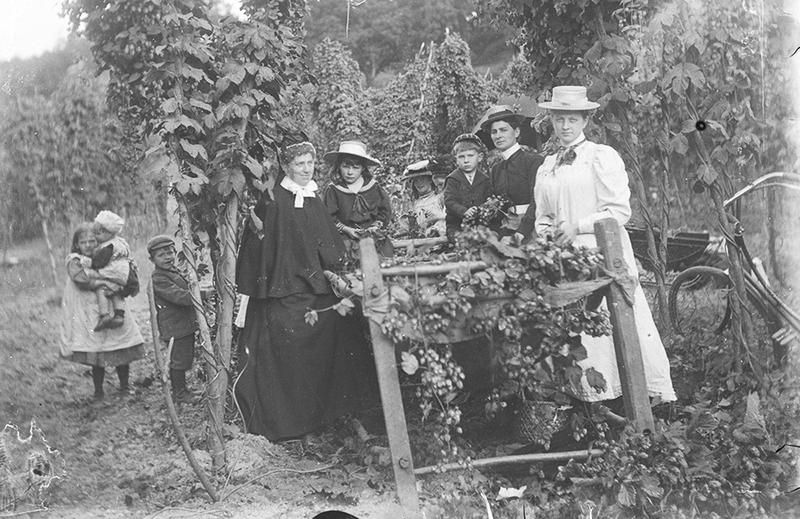 The hop wage could be borrowed against within the local community of traders in the home residential area, it could be borrowed against with local traders in the hop fields and it provided a source of income which was controlled by the community of women. It provided a source of respectability and trust which functioned for a much greater duration than the four weeks in the hop fields. Whilst from current perspectives, three to four weeks employment might not seem very much of a guarantee of payment to interests owed, if the size of household unit and the volume of earning power it represents are taken into account, then the equation is substantially changed. The letter or promised employment no doubt provided a base for the organisation of transport in many cases, for this letter was already a proof of respectability and trustworthiness as existing between employer and source of labour. The probability of trustworthiness being transferable to the hiring of transport for the making of the hopping journey and other related activities, such as the preparing of the hopping chest, was therefore high. What we have here is the development of a social dynamic in which the ‘trust space’ or, put in commercial terms, the extension of credit, is enlarged over time. Interestingly, such considerations of trust rarely feature in market descriptions of contractual relations. Repeated exchange over time is likely to produce such a ‘trust spiral’, with accompanying substantial increases in the ‘credit’ or ‘ debt’ space, where the experience of both parties to a set of transactions has been positive. 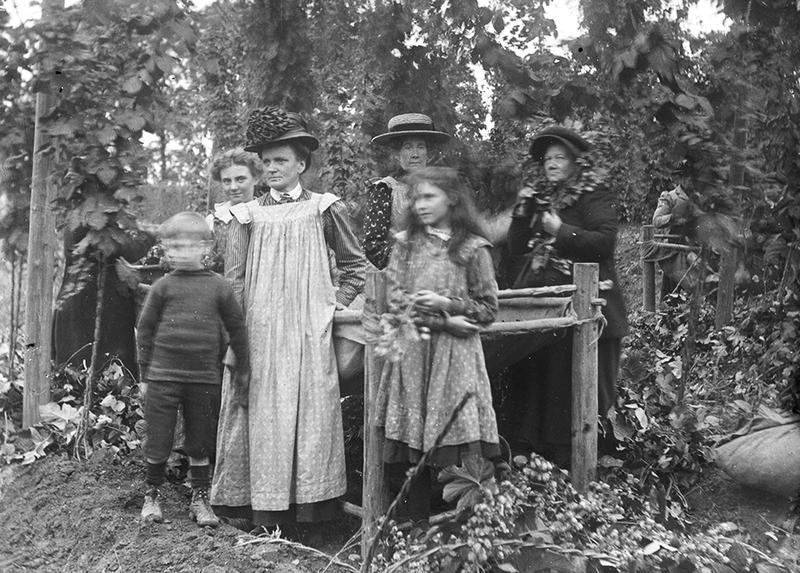 On the basis of oral history archive, it can be readily seen that such a relationship existed between matriarchs, traders and hop farmers through the first half of the twentieth century. 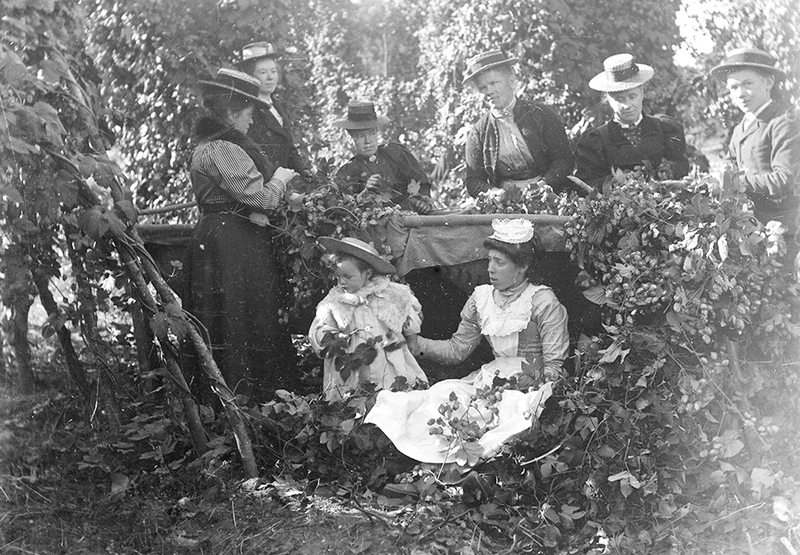 The oral history accounts of the hop pickers of east London and such written records as exist speak to the substantial presence of religious agencies on the hop fields attending to the moral welfare of this workforce and providing services such as tea tents, social activities for children and first aid assistance. 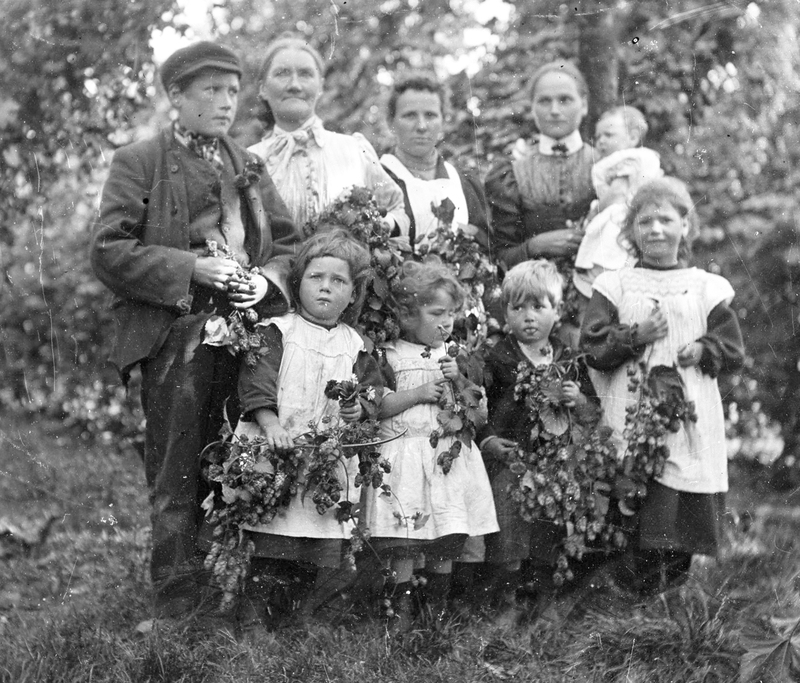 Hopping was an activity in which there were many minor injuries not least that of the bines creating cuts on the hands. 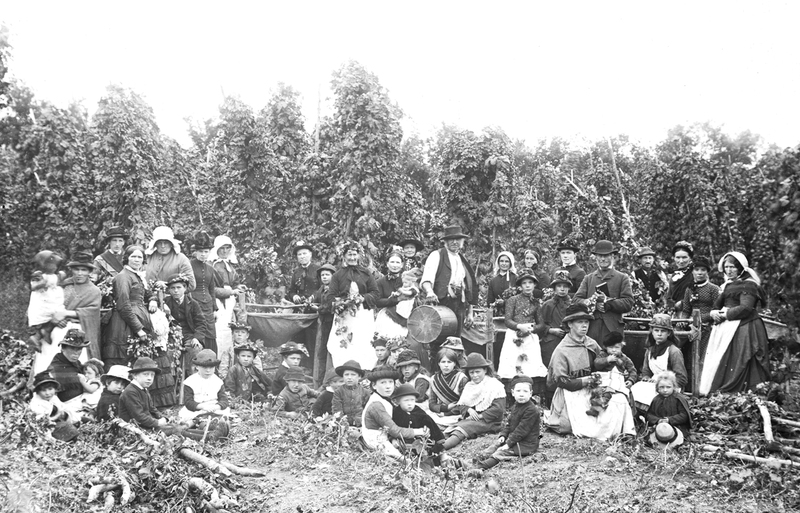 The oral histories around the Black Country hopping patterns do not in the main make much mention of the religious personnel active on the hop fields but there is some mention – and that of nuns. The evidence of Graham Paul Webb: For the hop-picking I had no clothes or shoes that were worthy of that name, and certainly no underpants. My ragged shorts, that were hand-downs from my older brothers, were only held up by string that was normally used to train the hop vines. My mum, a war widow with five kids and a pride that was bigger than her family, only accepted help once in her life and that was a pair of army hobnail boots for my bare feet. They were far too big for me and I had no socks to fill them up. I would traipse up and down the hop fields all day and the boots rubbed all the skin off my sock less heels. The inevitable happened, some bug got into my bloodstream and inflamed the back of my leg, and it was like a fire burning in my calf and travelled up my leg into my knee. I imagine that this was the same kind of thing troops had to put up with in the WWI trenches. 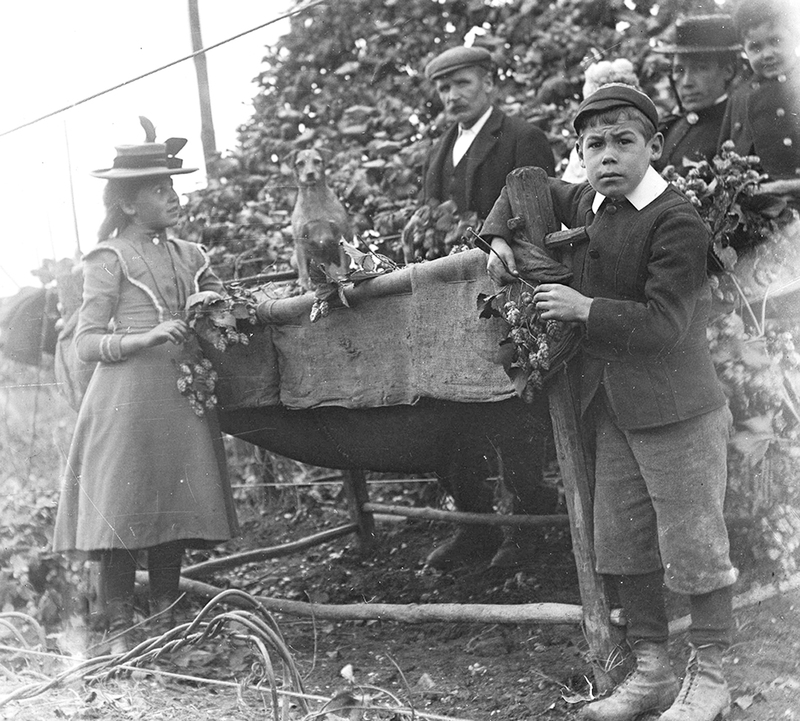 The task is now to recompose and reconstruct an online archive of hop picking and the Black Country which showcases the agricultural skills of the urban Brummie. 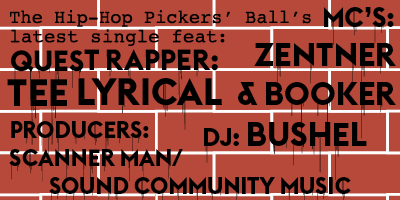 The harnessing of hopping employment for an annual holiday and festival of social repair by the urban working class is a social project of great social skill which has been ignored, sidelined and rendered invisible from British social history. 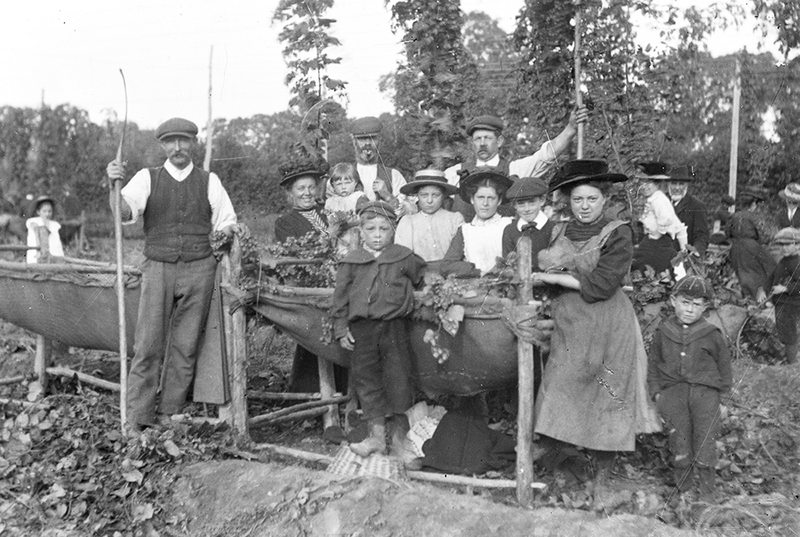 The communal synchronisation of families, streets and neighbourhoods of the urban environment of Birmingham and the Black Country on their annual hop picking ‘working holiday’ is a great social saga well worth preserving. Time for a correction, time for a Davenports.